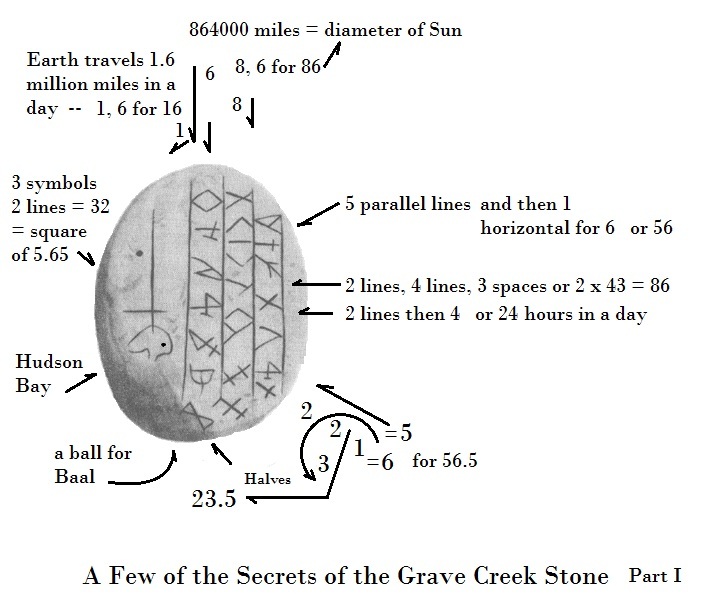 The Grave Creek Stone was found in the Grave Creek Mound close to the Ohio River in West Virginia. Translations have been done, one in jest, but none seem satisfying. An excellent place to review the controversy surrounding the stone is at J. Huston McCulloch’s site linked here. The original Smithsonian photo of the stone and Schoolcraft’s art are from his site and his efforts are greatly appreciated. Seth Eastman drawing of stone from Schoolcraft’s 1850 book. There are several ideas that have been consistently overlooked in translating the stone. The lines on the stone are always assumed to be guides for writing such as ruled school paper. 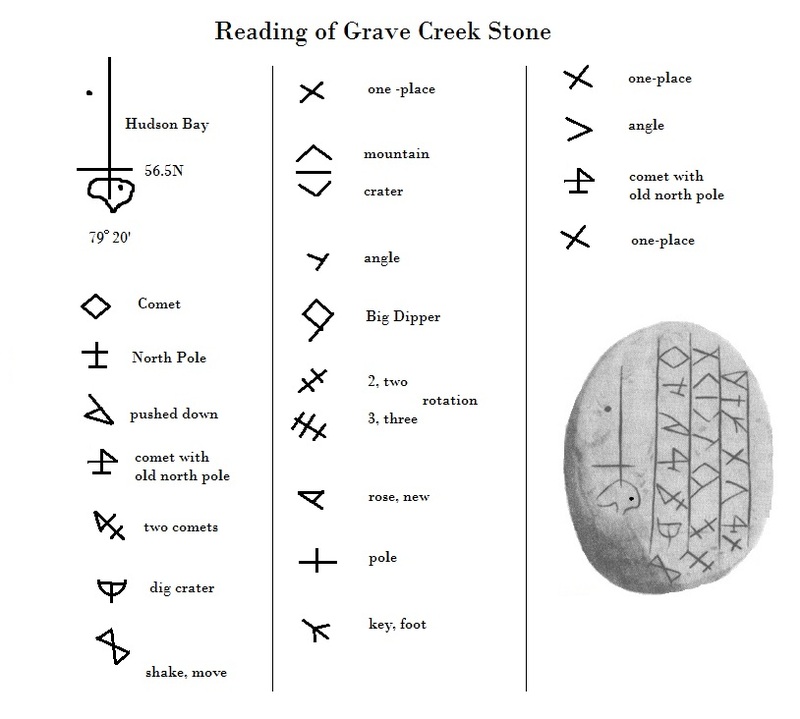 Since most persons attempting to translate this stone read and write English which is presented horizontally it has never occurred to anyone they are not guide lines and represent something else. Perhaps they represent lines of longitude and the stone should be rotated to be read in a vertical manner. Continuing with the idea they represent longitude note that the Grave Creek Mound lies at 80 degrees 44 minutes and 40 seconds West longitude and 39 degrees 55 minutes North. For easier understanding this is 80 44 40 and 39 55. 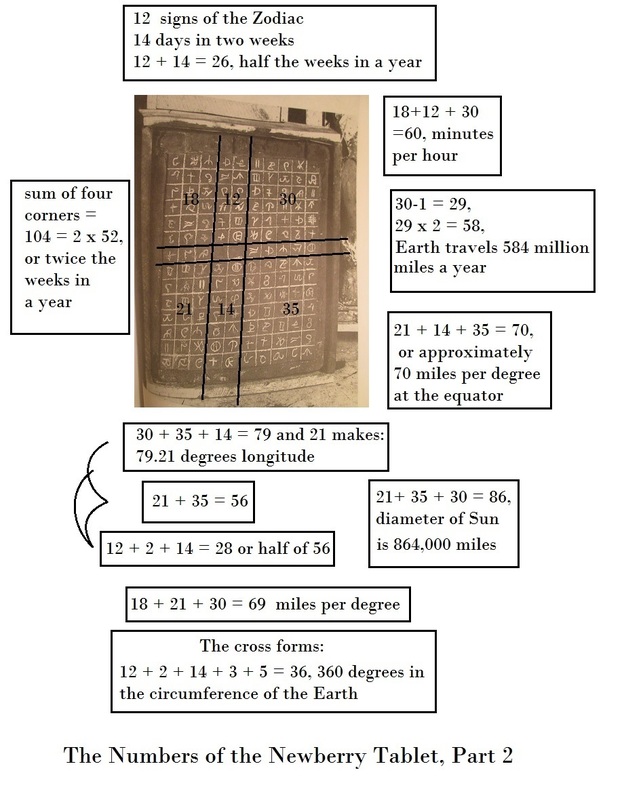 Twice the value of the latitude is 39.55 x 2 = 79.10. The 80 44 and 40 all sound very even and if 80 is 4 x 20 then they all repeat 4 . The sum of 80, 44 and 55 is 179 which repeats 79 and 1. This brings to mind that the sum of 79 and 1 is 80 or the longitude. But we assume that measurement of location was beyond North Americans until the European influence. Perhaps it was. But the numbers suggest otherwise. They speak of an awareness of Greenwich, England and its zero significance. 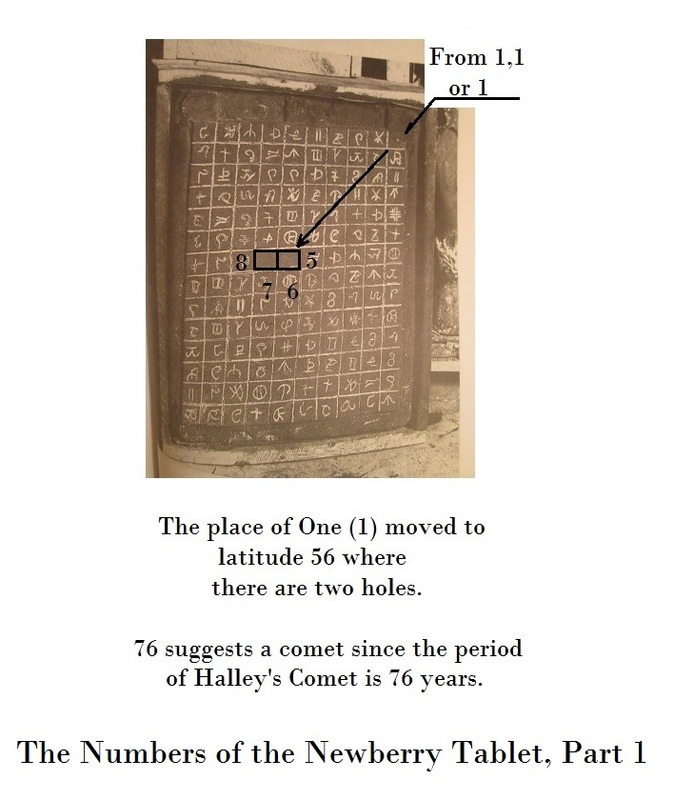 If the lines on the stone represent longitude and latitude then there is a very good reason to assume the longitude of this mound is not accidental. 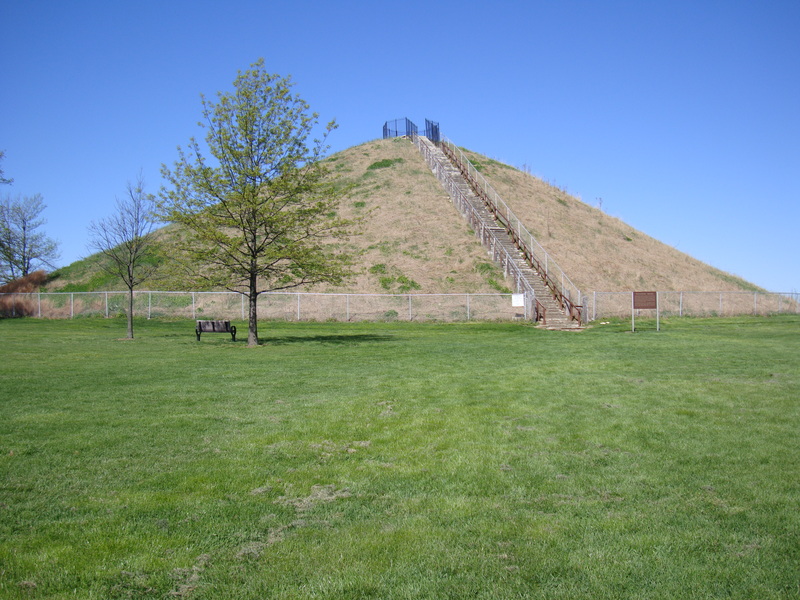 Compare the longitude and latitude of the Miamisburg Mound which is very similar and sits on the far side of Ohio below Dayton: 39 37 39.6 N which can be written 39.63. The radius of the Earth is 3960 miles. This number is found twice in this latitude. Double the number as done at Grave Creek and find 79.2. Both Grave Creek and Miamisburg demonstrate the radius of the planet in their positioning. The longitude: 84 16 51 repeats the 4 idea in two of the numbers. The latitude of Greenwich, England is just less than 51.51 degrees N. The 51 is the number of seconds of the longitude here. The sum of 84 and 16 is 100. The sum of 39, 37, and this 100 is 176 or twice 88 which once again emphasizes 4 as 4 x 22. A square of sides of 4 has a diagonal of 5.65. The mile is 60 x 88 feet. Consider also the location of the Alligator Effigy Mound a few miles west of the extensive Newark Earthworks in mid-Ohio. They lie at 40 4 12 N and 82 30 4 W. The latitude is once again full of 4’s. However the longitude, although nearly on the half degree, does not seem that significant until one realizes it can be written as 82.50 W. The former repeats the 4’s as expected. The latter is 528 in reverse or a tenth mile. The sum of 40, 4, 82, and 30 is 156 with the ever significant 56 at the end. The sum of 40, 4 and 12 is 56. The sum of 82 and 30 is 112 or twice 56. It is improbable that this site was chosen at random and displays these unique numbers just a few miles from an enormous earthwork that uses a 1/5th mile (1056 feet) as one of its major dimensions. 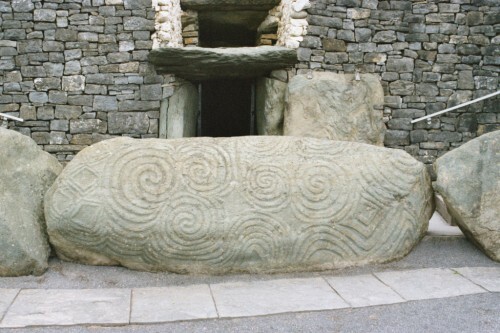 The decipherment of the stone resolves itself quickly as seen here when it is compared to Kerbstone 86 from the ancient ruins in Knowth, Ireland (3000 BC) and when compared to the Metcalf stone from Georgia. 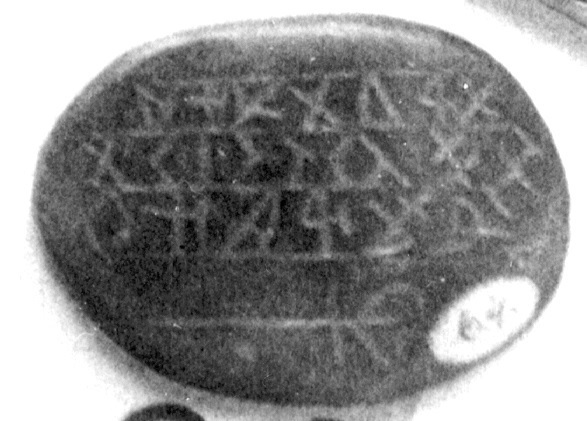 The Metcalf Stone began this series. The kerbstone was studied in a prior posting as well. The comparison shows the symbols from the kerbstone are located in the middle line if the stone is rotated and read in a vertical manner. Top is confirmed by comparison to the Metcalf stone as shown in the image. The two symbols at the bottom of the columns are out of alignment intentionally. One indicates 3 and the other 2 for 32 or the square of 5.65 is where the misalignment lies. 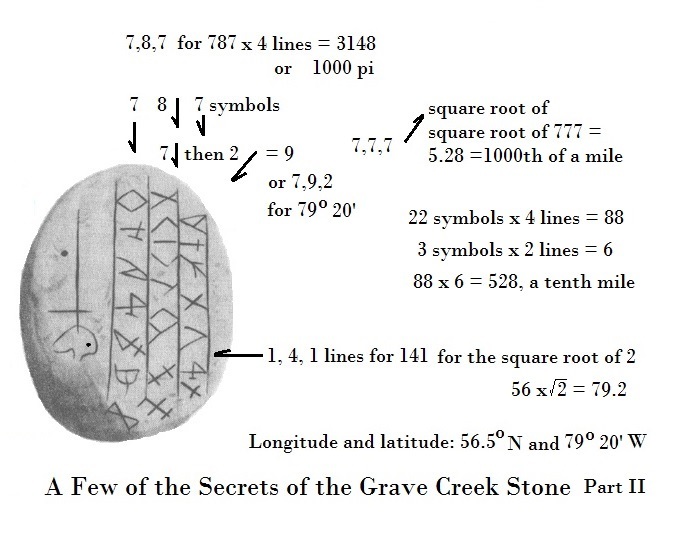 Although it is believed these glyphs are letters, it is more likely they are simple small pictures that tell the same story as the Metcalf and as depicted on the Mystery Stone from New Hampshire. 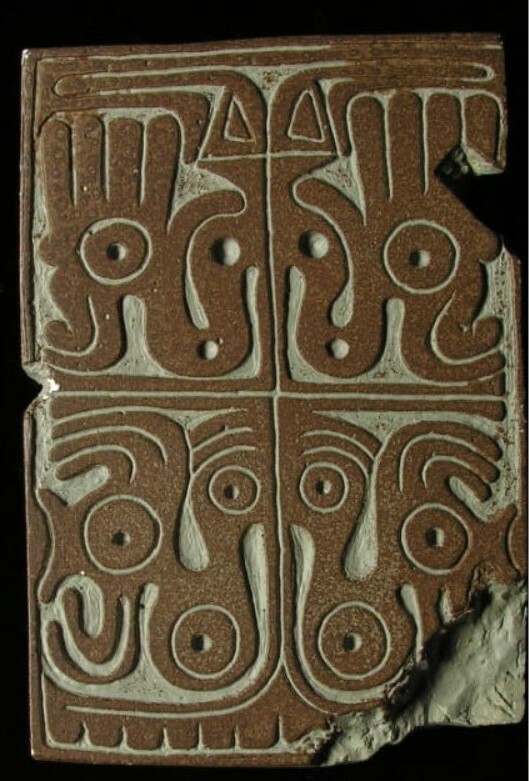 It is the same story depicted on the other Adena Tablets. Several of the glyphs appear to be forerunners to Phoenician letters including the symbols interpreted here as numbers at the bottom of the middle row. Oh High Yew! which still echoes in …………Ohio! The two eyes lie at 79 degrees and 56.5 degrees in the lake. The object struck the pole at the top and pushed it down. The pole was stricken by two arrows and craters. It was split and shaken. The one place of the mountain became a great valley. Arisen is a pole and it is the foot for measurement of angles. Measure also from the stricken pole place. The last stone in this translation series will be the Newberry Tablet. The numbers are easy. The translation is not finished. After that there are two other stones I have come upon but have to obtain photos which may take some months. So next up is the numbers of Newberry. Yes, same old, same old numbers! Imagine that! 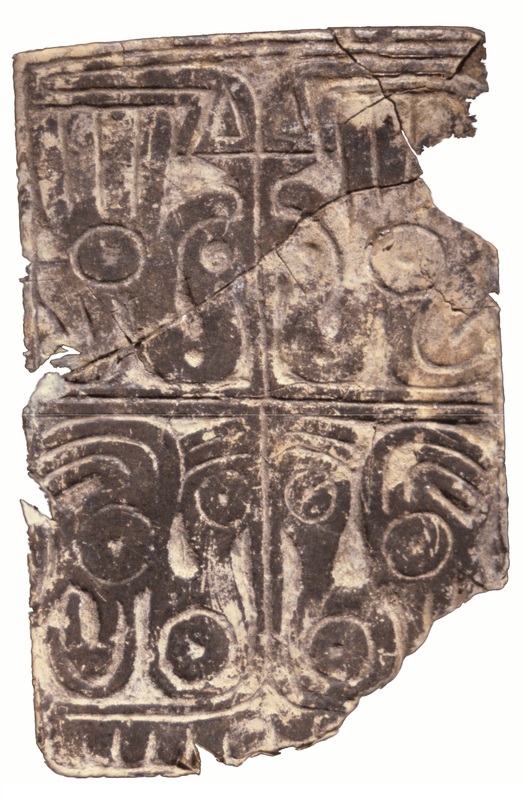 Art from ancient Ohio – Gaitskill Clay Tablet. Clay copy. Preserved from ancient Ohio is the Gaitskill Clay Tablet which gives us much to ponder. 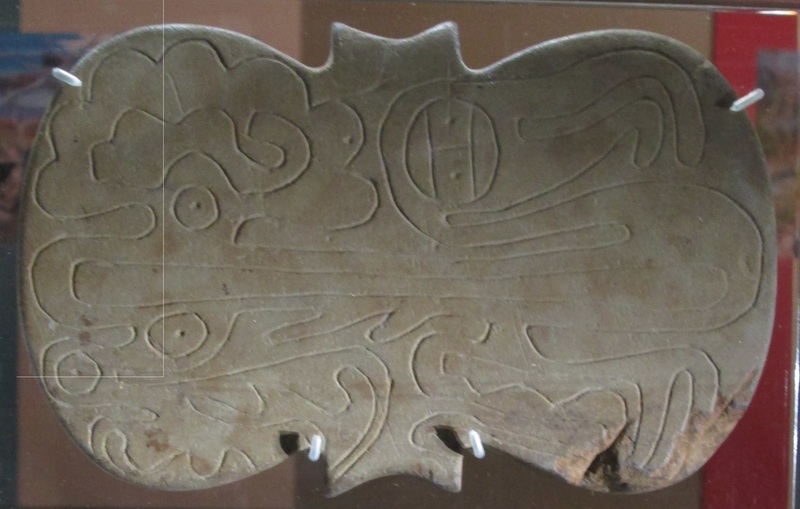 This stone has been described as having anthropomorphic and/or zoomorphic characteristics. Another author describes it as Avian with four world quarters. If we reflect on the open mouthed man who seemed to be crying ‘no’ in the Waverly Tablet and the angst of the Gaitskill Stone Tablet then it follows that what the artist is portraying is two hands held up as if to say, “Stop!” Above the hands appears two triangles which suggest this is another way of expressing the double eye of the comet Baal. Up and over on each side is the double tail of the comet. The two tails are similar in style to the feathers in the hat of the Prophet Glyph and the curved down feathers seen on the men in the Low Tablet. If the center line is taken as the pole then the reference to four quarters of the world is correct. There are other details we might notice. 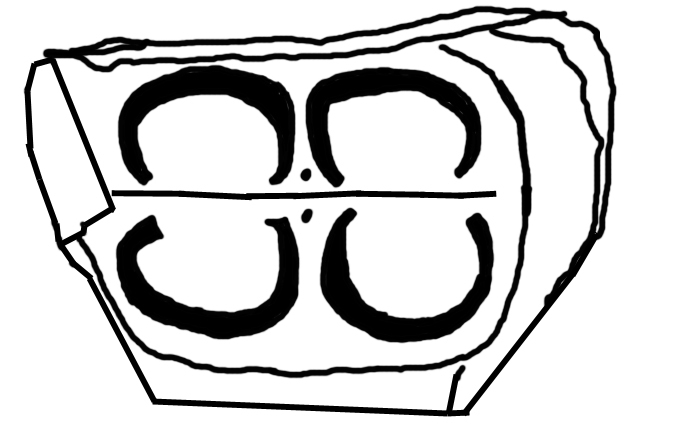 In the lower quadrants notice the three lobed wings above the large circle that are like those in the Low Tablet. The Luwian Hieroglyph Symbol #78 Ala meaning ‘wing of army’ is similar. The wing of the Army of Baal would be the debris that preceded, followed and was created by the comet. The image shows multiple circles suggesting many craters of various sizes occurred. In a prior post the name of the goddess Isis was discussed. It was suggested it means ‘ice-seat.’ At the base of the center pole on the tablet the lines fan out. Perhaps this symbolizes a mountain of ice or the mountain Isis at the seat of the North Pole. But the story these tablets relate is that the pole has a mirror image, a second location to which it moved. ‘Where?’ was the question asked by the Low and Waverly Tablets. Presumably the tablets answer the question. Perhaps this tablet will reveal the answer to us. The quoted dimensions of the stone are 4.4″ x 2.95″ x .55″. The last number is .01 off from 56 suggesting this was the desired thickness. But these stones vary too much in thickness to be so exact so 4.4″ x 2.9″ x .6″ is a better way to describe it. The 4.4 we will see repeated in the stone and discussed later. The sum of these terms is 7.9 inches. The diagonal of the stone squared is 28 and twice this is 56. The abstraction of the drawing is distracting to say the least. By counting the message becomes clearer. There are 8 large dot-circles. Of these, 6 are on the bottom. On the top there are 4 dots without outer circles and 2 remaining large circles. This gives us 8,6,4,2 which is a descending even series. When combined the familiar 86420 that is reminiscent of the diameter of the Sun at 864322 miles appears. Those 6 bottom circles can be counted out as 3,3. The top circles as 12, 21 or perhaps it is 1212 or 2121. This all seems familiar and the abstraction begins to make sense. The fingers on each hand give 4 and 4 for 44. The thumb finger combination gives 1414 which we have seen before. Recall 4 x 14 is 56. The bottom fringe can be counted out as 5 upward nips and then the center plus the other side (assumed to be a mirror image) makes 6 for 56. This was found in the same manner on the center strip of the Low Tablet. In the lower half the 3 wings to the left and 2 in the opposite direction makes 32 23. 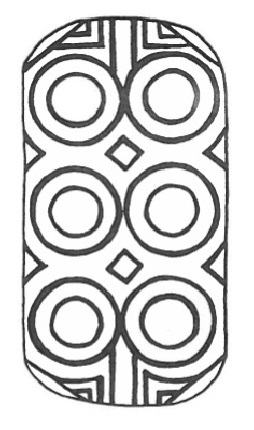 The 2, 3 pattern repeats in the two lower tails and the three circles. It repeats again on the left with two side tails and above it lies three lobes of the wing. Counting the 2 lower tails and the 2 side tails creates 22 which is half of 44. In the top half move around the exterior of the hand and count 2 lower tails, 4 fingers, 1 thumb for 241. Also count 2 lower tails, 1 large circle, 2 dots for 212. The 5 fingers on the hands plus 2 tails creates 52 suggesting weeks in a year. The total sum is 7 for the days in a week. The only number listed above that is new to our long list of numbers from the previous tablets is 44 but then again it is not so new. We already have 2486 suggesting the circumference of the Earth at 24881 miles and the very repetitive 56.5 listed. Divide the circumference of the planet by 565 and the term 44 appears. Thus the abstraction is a rather clever way to relate numbers to a people who are both distant in place and time with no common language. It is clear from this list that these numbers and the story related involves the Earth and that someone had advanced scientific knowledge which they wished to share with someone of similar mind. That would be us. The next tablet is equally abstract but rewarding to study. The Berlin Tablet is unique in its shape but not its message. 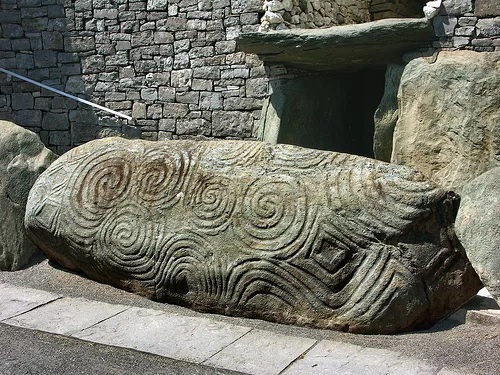 We begin by comparing it to artwork found at Knowth, Ireland. Kerbstone 86 depicts a strong image and a familiar shape. This stone was studied in a prior post but here the symbolism repeats in a totally different place. If one were to draw a bold outline around each lobe of the Berlin Tablet the same strong U shape appears. The line through the middle of the kerbstone has a dot on each side. The line through the middle of the tablet has a dot on each side. The kerbstone is considered to be 5000 years old and sits half a world a way. Like the Odd Little Purse in Olmec and Assyrian Art there is an obvious connection here. This symbol in Luwian Hieroglyphs is #363 Magnus meaning ‘great’ with sound value ‘ur’. Exactly as in Kerbstone 86 it is doubled and so we have ‘great-great.’ Another way to look at the doubled symbol is to consider the one opening down as Magnus or great, and the opposite opening up as a crater. Then the statement is ‘great-crater.’ This is wholly consistent with the idea of comets. Studying the image on the stone gives us once again something for the uninitiated. It looks like a bird with a very distorted eye next to a little tree. Here then is exactly what we saw in the remaining half of the Wright Tablet. The double tailed comet appears as the head. The odd eye is then a doubled eye within a comet which is flying towards a tree. This tree could be called the tree of life or the polar axis through Earth which is directed towards the Pole Star. So then we have a great-comet headed towards the great-tree. Within the tree is a similar shape as we saw in the nest portion of the Wright Tablet. Here it has seven strong lobes on the exterior and two on the interior plus the handle. Closer inspection reveals a lobe in the middle which is inwards so the inner image is the series 1,1,2 or twice 56. The total number of lobes is 9 so divided to make 2 and 7 or the number 792 which we recognize as the diameter of the planet. The number 72 is significant in relation to the polestar since precession causes the direction to which the axis points to change over time at the rate of 1 degree per 72 years. The two circles that inspired the above and the bar create another hieroglyph (#439) with sound ‘wa’ which was also central to Kerbstone 86. The meaning of ‘wa’ in Old English is woe. Pushed further to the left is another ‘sa’ circle so that once again we find 1 circle, 1 line, 2 circles for 112 or twice 56. The artist was thorough in expressing 112 for along the lower side of the bar are two jut outs that create 1,1 and then 2 circled circles. What then is the rest of the distorted image? Spending time counting it seems futile for it is truly a mess and that is probably the full intention of the artist. 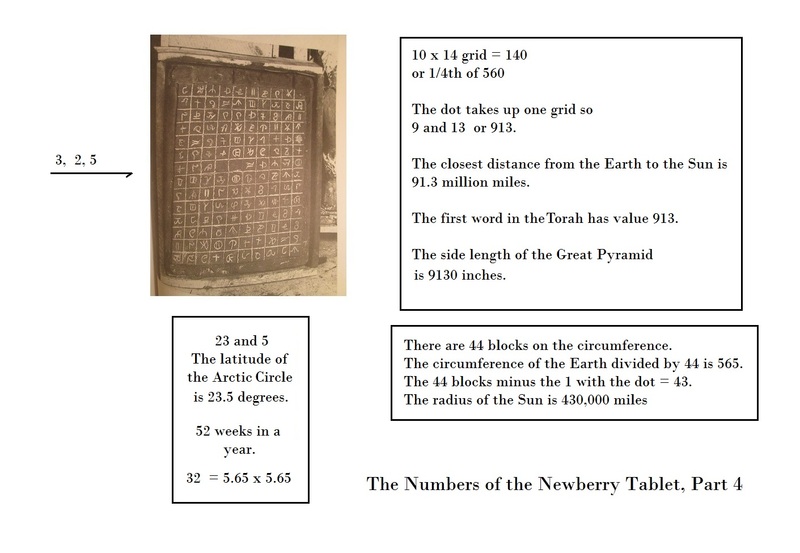 But careful study reveals 2’s and 3’s and these numbers have been seen in the other tablets as 23 32 and 23.5. They imply the limit of the Arctic Circle. So then, the great comet strikes the polar tree, the sess, seat of all measurement. A great-crater forms. It was woeful as all was destroyed. The world is literally a mess. This is the same message as found in the New Hampshire Mystery Stone, the Newark Earthworks, and Aberlemno Stone of Scotland. They tell the story of a comet impact. They even allude to the correct shape of the Earth in the overall shape of the stone with the new pole north-south as we know it today. Comments have been made in relation to these posts that this sort of an impact would have killed nearly all life on the planet and therefore it is impossible for these artists to be relating something so fantastic. But this is what the artist shows – devastation of unimaginable proportions. It does not require this artist to have lived through it. Indeed, mythological and actual history report that few life forms lived through the deluge as confirmed by the massive skeletal debris piles found on various continents. These events were witnessed and survived by a few people, perhaps those out of harm’s way on the far side of the world. They recorded it as strange images such as “The Venus of Willendorf.” Their children, spurned on by legends of their grandparents, later came to view the destruction and pay homage to vanished civilizations and life. Some remained behind to restart civilization on the American continents and others returned to their homelands having viewed the devastation firsthand. Perhaps the Gaitskill Stone Tablet will prove this all wrong!! It’s cartoon-ish features are of a fearsome spider. 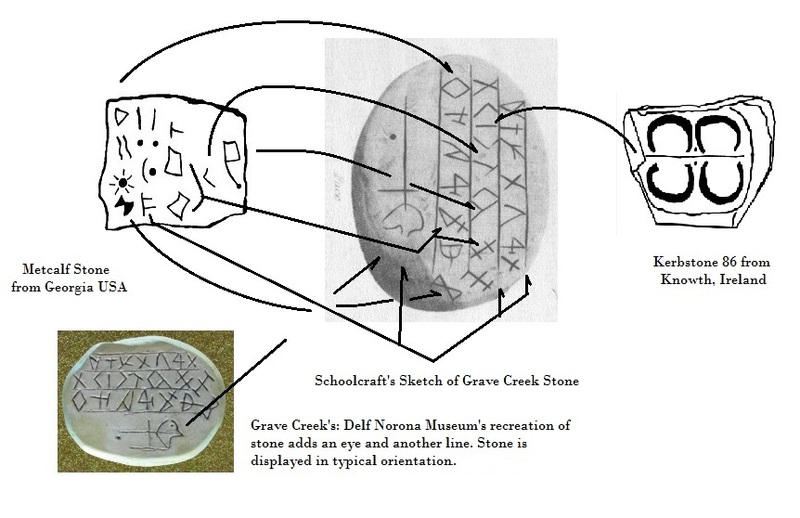 The Adena Tablet most similar in design to the Allen is the Grave Creek Tablet. The only existing drawings are from Henry R. Schoolcraft done in 1845 and a re-drawing done in 1851 by Eastman. 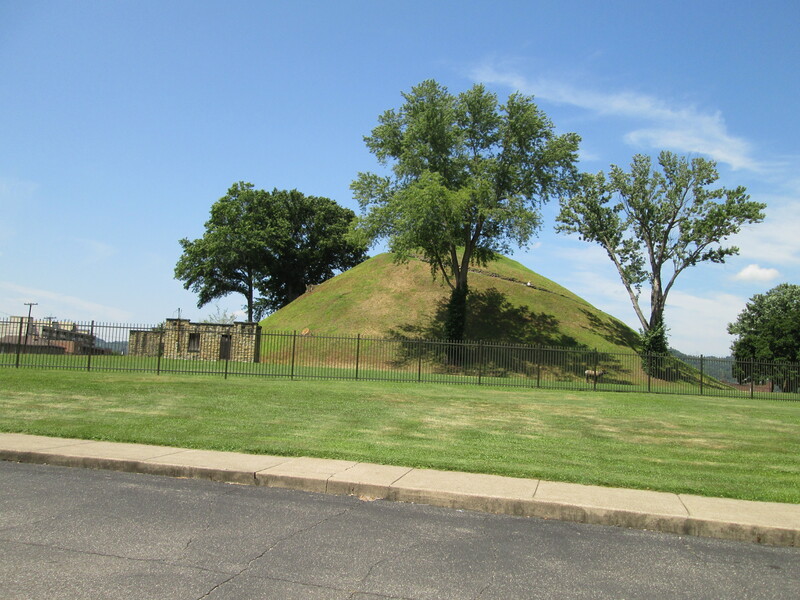 It was found at the Grave Creek Mound which lies next to the Ohio River in West Virginia. 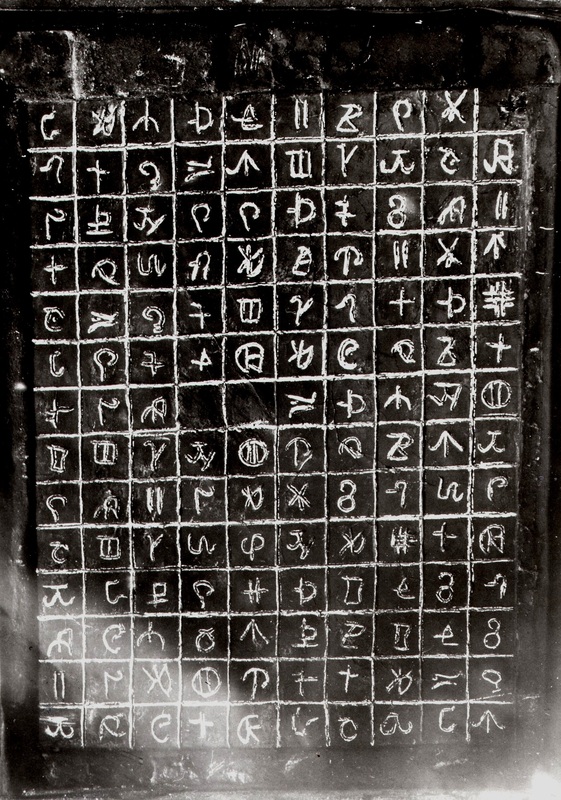 Grave Creek Tablet. after Eastman drawing and Schoolcraft 1851. Once again we see the six circles aligned in two rows but this time there are details. Two squares are in the middle in alignment with two sets of vertical lines so that this design forms the center of the image. The exterior triangles are so placed to give the impression that if it was possible the stone would have been removed at these places so that it would have been six circles joined by the center bar. Additionally, the triangles in the upper/lower center are doubled so that there are four sets of two or 8 angles. There are six circles, four side angles and two inner squares. We might sum up the image by saying 8,6,4,2, or 8642, or at the very least a series of even numbers. 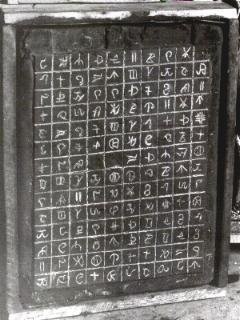 To go deeper into the meaning of this tablet we must interpret the symbols. This requires a translation of the most difficult type. The meaning and/or sounds associated with the symbols is unknown and so is the language of the people who made the symbols. However, we do have insight into the story that is being related by the stones if we accept the Metcalf Stone’s interpretation as accurate. But then again, Georgia is a long way from Ohio and there is no reason to think the artists were attempting to depict the same subject. More notably the resemblance to any other script does not mean the person who made the art was using it the way other persons have. With that caveat …. This image is so strikingly similar to a Luwian Hieroglyph that it must be noted. These glyphs have been discussed in other posts and the point has been made that the word Luwian should actually be La Ang-a. The glyph is #191 and is called the Sun, or Sol in Latin. This is not the only glyph to be found on these tablets so its significance should be explored. Note that the diameter of the Sun is 864,322 and this is similar to the number 8642 above. The number of seconds in a day, 86400, is also similar. Another glyph is clearly found and that is #402 Scutella meaning shield. This is simply the double concentric circle. Its sound is ‘sa.’ Could this be six sa or sores? The two diamonds in the center may be glyph #423. It is a small rhomboid and has the sound ‘ku.’ This then gives us the opportunity to sound out a few ancient (however improbable) words. So we have sa-sa, ku-sa-sa, ku-sa-sa. It has already been suggested that these are Luwian (or La Ang-a) words and a good source of La Ang-a might be an Anglo-Saxon dictionary. Thus these interesting words: sa-sa is ‘sess’ just like in sister which means ‘a seat.’ So a sister is a seat. (The ‘ter’ just means it is a noun.) We can also find the word ceac which means cauldron or vat. It is the root word of castle which comes from its variant ceas meaning quarrel. Either word ceac or ceas will do and in reality both are descriptive. It is ‘a cup or place of a quarrel’ which is reinforced by following it by a word which means seat (sa-sa or sess). So perhaps it reads sess, keas-sess, keas-sess. In modern terms it could be seat, quarrel-seat, quarrel-seat. The Metcalf Stone supplies the answer to what a ‘quarrel-seat’ or ‘keas-sess’ might be. A comet crater is the seat of an impact or a quarrel between planet and comet. It also explains the association of cup to quarrel. We might also pause to note that the rhomboid had a ‘ku’ sound and both cup and quarrel preserve this sound. This tablet does not reveal any details that confirm this in any way. What is very real though are the numbers clearly portrayed. Three circles and three circles creates 33. Six circles (concentric) and six more becomes 66. Two squares and three circles is 23 and its reverse is 32 for 23 32 as we saw in the last post. The pattern 2,1,2,1,2 as 21212 which can be looked at as something that repeats. Interestingly, 21212 x pi is 66637. Pi is used in circular measure such as measuring the velocity of Earth at 66624 mph. Twenty-six is also dramatically formed by the circles and squares, and 2 x 26 is 52. 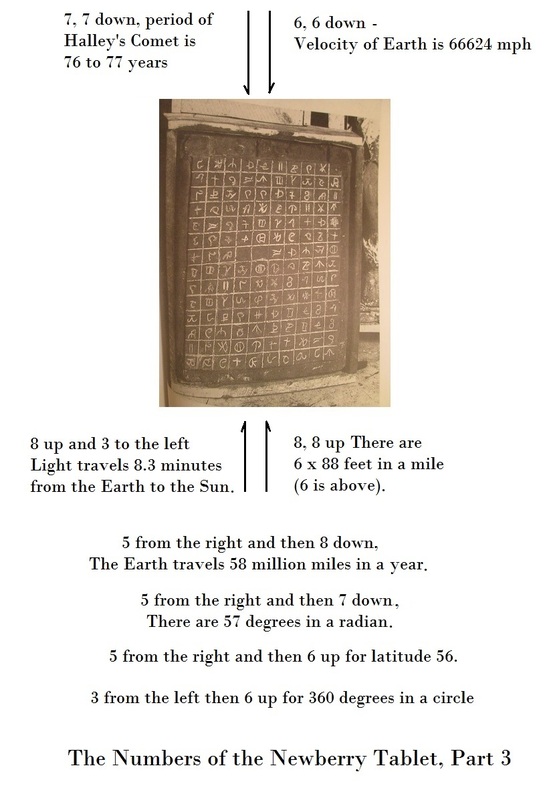 The number 56 can be formed in the same manner as it was found on the Allen Tablet or 2 + 3 = 5 and 2 x 3 = 6. This stone then gives us the following collection of numbers: 8642, 33, 66, 56, 23 32, 52 and 21212 which builds upon the prior list of 7, 33, 34, 23.5, 23 32 and 56. To simplify, it has been previously found that the 33 and 34 relate to the same concept. The 23.5 and 23 32 as we saw in the prior post are equivalent. The 7 and 52 are also obviously interrelated as in days in a week and weeks in a year. And here we must end, since this is a tablet which expects us to know the story to appreciate its message. We will look next at the bottom portion of a stone which still actually exists!!! and can be seen!!! The Kiefer Tablet is in the Ohio Historical Society Museum and we shall study it next.